Located in the picturesque heart of Italy, Tuscany is known for its stunning scenery and for producing some of the world’s best wines. Many Tuscan wineries are located in the central hills around Florence and Siena, extending east towards the Mediterranean coast. Tuscany contains numerous subzones with national recognition, areas that must comply with Italian laws to assure wine quality. These laws include a labeling system, with two designations awarded to quality wines that have been government tasted and analyzed. DOC (controlled designation of origin) is given to wines from small and medium wineries, and indicates the location and type of grape. The stricter DOCG (controlled designation of origin guaranteed) label is given to wines that have consistently met DOC requirements for a certain number of years, with further restrictions regarding bottle size and reputation. Producers also have the option to number their DOCG bottles. There are additional labels for wines that don’t meet these qualifications. VDT (table wine) is the most basic classification. Twenty years ago a new classification, IGT (indication of geographic type), was implemented as a level above VDT, applied to quality wines that may use grapes different from those required for a DOC or DOCG designation. 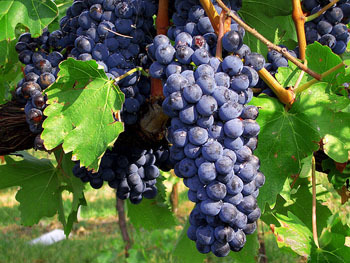 Sangiovese is the most widely planted grape in Tuscany. Noteworthy red wines produced from the native grape include Chianti, Brunello di Montalcino, Vino Nobile di Montepulciano, Rosso di Montepulciano, Carmignano, and Super Tuscans. 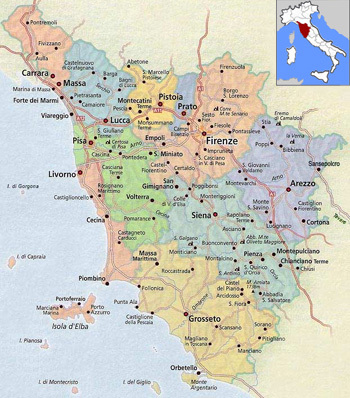 Chianti, the most common and widely sold Tuscan wine, is produced in eight district zones that cover a vast territory around the original center of Chianti Classico. Chianti comes in various styles: some are smooth and round, easy to drink young; others need years to develop aromas and flavors distinctive of aged Tuscan reds. The wines show a deep ruby-garnet color and present a light to medium body, with cherry and cranberry as the leading flavor. But you can find cocoa, espresso, tobacco, and oak in the older vintages. Easy to drink, Chianti is a great choice with pizza and pasta. Brunello di Montalcino is one of the most highly rated and expensive Italian wines, and to many oenophiles, the best. Produced in Montalcino, Brunello was the first wine to receive DOCG status—the highest guarantee of quality. Made from 100 percent Sangiovese Grosso, it’s aged for four years (five for reserve) in oak barrels to yield a full-bodied, complex wine with a deep ruby color and intense flavor and tannins. Rosso di Montalcino is a younger, fruitier wine that needs less aging. 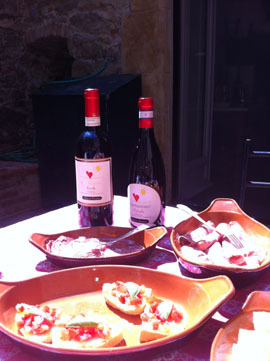 Both wines pair perfectly with Tuscany’s renowned Florentine beefsteak, from Chianina, a special breed of white cattle. 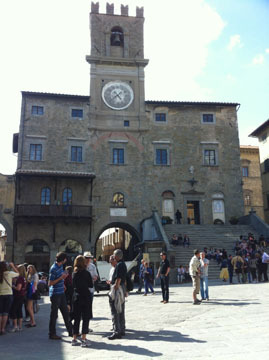 Vino Nobile di Montepulciano, from the ancient town of Montepulciano, is another well respected wine. More versatile than Brunello, the wine is made from a type of Sangiovese known as Prugnolo Gentile, with a deep garnet color and intense flavors of fruit and violets. It pairs well with meats, sharp cheeses, and dried fruits. Rosso di Montepulciano is a younger alternative with more subtle flavors. 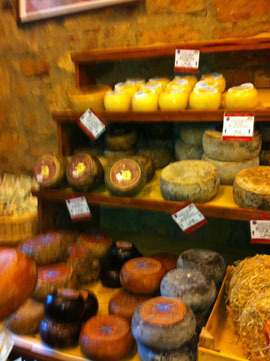 Carmignano has a long history; it was recognized and enjoyed by the Grand Duke of Tuscany in 1716. It is another Tuscan DOCG and one of the first Tuscan region's awarded official designation, for wines that include Cabernet Sauvignon and Cabernet Franc. The wines are structured and elegant, with floral notes and plenty of berry, leather, and licorice flavors. Super Tuscans are popular wines that are made using numerous grape varietals, including Sangiovese, Cabernet Sauvignon, Cabernet Franc, and Merlot. Producers of Super Tuscans have a reputation for being daring and artistic while maintaining a sense of tradition. Due to the stringent Italian classification system, early Super Tuscans like Sassicaia, Tignanello, and Ornellaia were initially classified as VDT; the IGT classification was created to give these wines their due recognition. Super Tuscans are velvety smooth, yet big and juicy, with scents of blackberry and coffee, followed by a delicate finish. They are Bordeaux-style wines that satisfy all tastes, pairing well with red meat and all pasta dishes. White wines are now emerging out of Tuscany. Vermentino is one varietal that is becoming popular, with vineyards planted in the coastal hills of Tuscany close to the sea. Vernaccia di San Gimignano, one of the only DOCG whites, produced in the medieval village of San Gimignano, is a dry, full-bodied wine with a rich floral bouquet and good fruit. Either choice is wonderful as an aperitif or alongside salads and fish. Vin Santo, a dessert wine, is the pride of most producers in Tuscany. Pressed from dry grapes and aged from three to 10 years in small wooden barrels, Vin Santo is made from mostly Malvasia and Trebbiano white grape varietals. The wine has amber hues with flavors of honey, nuts, and raisins and hints of orange, with a creamy finish. A great meal ends with the popular tradition of dunking biscotti into a glass of Vin Santo. Baracchi Winery in Cortona, is part of Il Falconiere—a Relais & Chateaux inn, Michelin-starred restaurant, and deluxe spa. Owner Riccardo Baracchi is the first producer of a sparkling wine from 100 percent Sangiovese grapes, Baracchi Brut Rosé. The wine is delightful, dry yet silky, with aromas and flavors of wild rose and berries, and finishing with hints of almond and spice. Baracchi’s Ardito (equal parts Syrah and Cabernet) has received numerous awards. A family legacy, Cantina Crociani is managed by Susanna Crociani, who takes an innovative and creative approach with her winery– the only one located in the village of Montepulciano. It has a beautiful historic tasting cellar filled with wine barrels, where guests can sample Vino Nobile di Montepulciano—the most prestigious wine in the area. 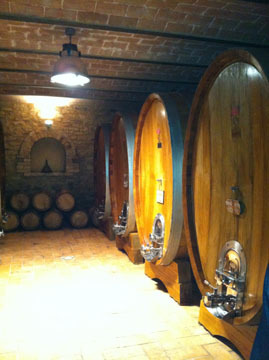 Crociani also makes Rosso di Montepulciano, a great Grappa (a distilled grape liqueur), and a noteworthy Vin Santo. The winery is part of an 18th-century country estate, located in one of the best areas to grow grapes and olives. Proprietor Alberto Guadagnini grows Sangiovese, Cabernet Sauvignon, and Merlot grapes, and produces a selection of Super Tuscans. The Argante, made from Cabernet Sauvignon and Merlot, is winning many accolades. It’s a full-bodied wine with sweet fruit flavors and a velvety finish. They also make a spicy olive oil, one of my favorites from Tuscany. This large, important estate has been family owned since the late 1800s. Today it is run by brothers Cesare and Andrea Cecchi, who oversee three properties in Tuscany. Castella in Chianti is their headquarters and home to outstanding Chianti and other red wines; San Gimignano is where they produce the white wine Vernaccia San Gimignano; and Maremma is the location of their newest state-of-the-art winery. Cecchi wines are well known in the United States and around the world. Situated just northeast of Florence in Chianti Rufina, this historic estate has been in the Giuntini family since 1827. Owner Federico Giuntini Masseti keeps a large collection of the wines made since 1947 (during World War II, the Germans confiscated earlier vintages) in a medieval wine cellar. The Vigneto Bucerchiale, a Chianti Rufina DOCG Riserva, is their flagship wine, produced from best vintages. Selvapiana has been on the Wine Spectator Top 100 List three times. The winery is owned by the Manettis, a family linked for centuries to the production of terra-cotta tiles. The winery and vineyards, certified organic, are located in Panzano, the heart of Chianti Classico, in an area surrounding the Conca d’Oro (Golden Shell)—the perfect place for Sangiovese to thrive. Their flagship wine, Flaccianello delle Pieve, made from 100 percent Sangiovese, is a three-time finisher on Wine Spectator’s Top 100 List. Located near an Etruscan archeological site in Rufina, Frascole consists of a group of farmhouses built during the Middle Ages. This estate is family owned, purchased by Enrico Lippi in the mid 1990s. All vineyard farming is certified organic. They produce a small amount of Frascole and Bitornino, both Chianti Rufina DOCG wines; Frascole Riserva, a Chianti Riserva DOCG; and a Super Tuscan Venia Toscana IGT. Frascole is famous for its award-winning Vin Santo, which is also my favorite. In 1973, Italian movie director Italo Zingarelli, creator of “spaghetti westerns”, bought and restored Le Macìe. He released his first Chianti Classico in 1979. Zingarelli purchased other estates (there are now six) and continues to make exceptional wines. Today, his son Sergio runs the company. Wines include Chianti Classico Famiglia Zingarelli and Ser Gioveto, a blend of Sangiovese, Cabernet Sauvignon and Merlot, created by Italo when his son first joined the company in 1985. This winery is named for the seven bridges crossing the Arno River on the road from Arezzo to Florence. The closest bridge to Sette Ponti is Ponte Buriano, depicted in Leonardo DaVinci’s Mona Lisa. Today, owner Dr. Antonio Moretti produces Sangiovese, Cabernet Sauvignon, and Merlot, as well as small amounts of local indigenous grape varietals. Moretti’s masterpiece, Oreno, is an award-winning blend—explosive, elegant, and rich in structure.